Left: Intricate architectural details and trim work define the Italian Renaissance Revival architectural style of this Clearwater Beach home. Sweeping lighted stairs create a dramatic walkway to the front door. The turret houses a grand staircase which is not just a feature of the internal architecture but also intentionally viewed from outside. 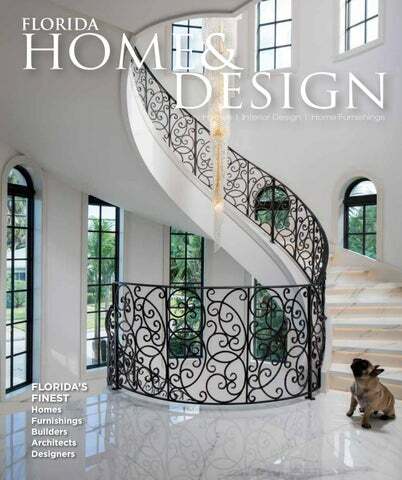 Right: Even the family’s French bulldog is mesmerized by the glistening twostory chandelier illuminating the spiral staircase which achieves the grandeur and sophistication the clients desired. White large format porcelain tile flooring used throughout the home provides the look of marble with beach-front durability. Custom wrought-iron railings on the stairs and second-story balcony hallway add old-world charm. Left: The home’s two-story great room ceiling detail is a favorite of architect Dawson. accentuated the room’s volume with fulllength watery-blue sheers from S. Harris. A sparkling Corbett Lighting Chandelier maintains a feel of glamor and elegance. A clean-lined custom Vanguard sofa adds contemporary contrast. Above Left: The wet bar cabinetry provides climatized wine storage for both whites and reds. The mix of material continues here with a metal backsplash and cast iron doors leading to a small room that houses the kitchen ovens, microwave, and a large pantry out of sight of the main kitchen. Above: An 11-foot island illuminated by a quartet of Corbett Lighting pendants is at the heart of this kitchen, custom-designed by AlliKristé Cabinetry. Kitchen designer Bob Ostrowski selected a mix of paint, wood stain and black for the custom cabinetry, “I like the idea of using a mix to give the space a feeling of warmth. The kitchen blends custom finishes and materials to create texture.” A wall cabinet placed over a window allows a flood of natural light and provides an ever-changing background view. Guests need little more than the view to enhance their stay in this waterfront retreat. The room is in keeping with the coastal glam of the home, but creates a more serene space with organic hues and natural textured Kravet drapery. The stair landing introduces a tailored feel to the upstairs. An onyx table softens the color palette and brings in a natural element. The desired touch of glamour is prevalent in the deep blue velvet sofa and chandelier illuminating the intimate space. Above: Playing off of the arch details in the architecture, the designers brought the same element into the tile, cabinetry, and mirror design of the master bath. Dramatic black and white Sophie, waterjet stone mosaic tile from New Ravenna Tile creates a bold statement against the white vanity cabinetry. The Corbett Lighting chandelier is positioned at the entry to the dual-sided shower which runs the entire length of the bathroom. Brizio faucets from Ferguson Bath, Kitchen & Lighting Gallery are used in the shower and at the vanity sinks. A glamorous walk-in closet by California Closets completes the master retreat. Above: The master bedroom brings a New York edge to the beachfront property, according to designer Miller. The essence of comfortable luxury in the bedding with Pyar & Co. pillows, Caracole furnishings, and Maxwell Fabrics drapery is accented by John Richard accessories for a touch of glamour. â&#x20AC;&#x153;These clients were fun to work with; they were not afraid of unique materials. It really was a collaborative effort with our team and the clients to create a special look,â&#x20AC;? notes Miller. Steps from the beach at the base of the three-story home, the pool provides a refreshing escape on hot Florida days. Its dancing fountains and comfortable lounge area are a fitting finish to this romantic beachside retreat. Above: A daybed swing and comfortable seating furnish this second-floor balconyâ&#x20AC;&#x201D;a frequent gathering spot for morning coffee and sunset viewing. ichelle, the co-founder and principal designer of Michelle Miller Design, is an educated, trained, accredited and licensed professional interior designer. After starting her career in theatrical and television set design, Michelle transitioned to hospitality and commercial design ﬁelds. Her extensive knowledge and unique passion for design then drove her to open her own interior design ﬁrm in 2002 that would specialize in high-end residential design. Michelle’s experience as an avid world traveler allows her to incorporate elements of European and Asian cultures into her work. 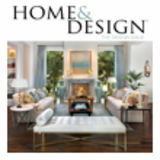 Michelle Miller Design has grown into a prominent design ﬁrm on a national and international scale. Michelle’s work is featured in the homes, stores, and venues of Wolfgang Puck, House Beautiful, Coach, Marie Claire, and more.